Late in the 1950s, the Soviet Navy’s nuclear-powered submarines—starting with the November-class attack submarine—could dive twice as deep as most of their American counterparts and often had higher maximum speed. But they had a conspicuous flaw: they were a lot noisier. That meant American subs were routinely detecting and trailing the Soviet submarines from a distance without being detected in return—a huge advantage had there ever been a conflict. In the 1980s, however, the Soviet Navy began to improve its acoustic stealth game. The Japanese Toshiba and Norwegian Kongsberg firms had sold propeller-milling technology to the Soviets that allowed for a much quieter seven-bladed propeller on its new Akula-class attack submarines. U.S. Navy studies concluded the Akula exceeded the mainstay of the U.S. submarine force, the Los Angeles class, for acoustic stealth and roughly matched the Improved Los Angeles variant. As the Pentagon was flush with money during the Reagan administration, in 1983 the Navy began designing the biggest, baddest—and fastest and quietest—attack submarine possible to restore its edge over the Soviet Navy. The resulting Seawolf laid down by Electric Boat in October 1989 had a wider hull than the 7,000-ton Los Angeles, displacing over 9,000 tons submerged and measuring 108 meters in length. Whereas the Los Angeles carried 37 torpedoes in four tubes, the Sea Wolf could lug fifty heavy-weight 533-millimeter Mark 48 torpedoes or Harpoon anti-ship missiles, which it could launch through eight over-sized 660-millimeter torpedo tubes. (The tubes size was meant to future-proof in case the Navy adopted larger weapons. It didn’t.) The Seawolf could also use the tubes to launch surface-attack Tomahawk missiles. The Seawolf submarine was built entirely out of higher-strength HY-100 steel so that it could endure dives as deep as 490 meters. Its sail (conning tower) was reinforced for operations Arctic ice, where Soviet ballistic-missile submarines were known to lurk. Moreover, its S6W pressurized water reactor gave the Seawolf an extraordinary maximum speed of 35 knots (40 miles per hour), allowing it to chase down disengaging adversaries. But most impressive were the Seawolf’s advancements in acoustic stealth: a Seawolf was an order of magnitude quieter than even the Improved Los Angeles boats at 95 decibels. Oceanic background noise averages 90 decibels. Even better, the Seawolf’s propeller-less pump-jet propulsion system allowed it to maintain acoustic stealth even when cruising a brisk 20 knots, whereas most submarines are forced to crawl at 5-12 knots to remain discrete. Its huge 7.3-meter diameter spherical sonar array on the bow was supplemented by wide-aperture flank arrays and TB-16D and TB-29 towed arrays. These feed sensor data to the Seawolf’s BSY-2 combat system, which can engage multiple targets simultaneously using Mark 48 torpedoes directed either via a wire connected to the sub, or using their own organic sonar. Thus, the Sea Wolf was designed as the ultimate submarine-hunter: stealthier, more heavily armed, and able to match or exceed its adversaries in speed and maneuverability. These exquisite capabilities came at a steep price—namely $33 billion for twelve Seawolves, cut down from the initial plans for 29. Adjusted for 2018 dollars, that comes out to nearly $5 billion per sub, three times the cost of the Los Angeles boats. The HY100 steel also particularly suffered extensive weld-cracking problems, necessitating additional reconstruction. Following the dissolution of the Soviet Union, the Seawolf’s premium capabilities and expense could hardly be justified as large numbers of Russian submarines rusted away at their docks. Thus the Seawolf order was downsized to just three submarines which launched between 1995 and 2004: the Seawolf, the Connecticut, and the Jimmy Carter, numbered SSN-21 through 23. All three are based on the Pacific Ocean at Naval Base Kitsap-Bangor in Washington State. The last boat, the Carter uniquely was modified at an extra cost of $887 million into the ultimate spy and special operations submarine. Its hull was lengthened by 30 meters to incorporate a special Multi-Mission Platform which can carry divers, or manned or unmanned underwater reconnaissance vehicles which can be deployed using special locks. The 12,000-ton Carter also boasts thrusters allowing it to maneuver more precisely while in treacherous shallow waters and ocean floors. It is also understood to carry instruments allowing it to tap the undersea cables through which the internet and other long-distance communications travel. Naturally, the Carter’s clandestine activities remain a secret, though its reception of numerous unit citations for unspecified reasons suggest an eventful operational career. It’s known to have deployed an aerial drone to spy on North Korean coastal artillery, and it returned to port in 2017 flying a black pirate flag—traditionally flourished by a submarine returning from a patrol in which it has scored a victory. In fact, all of the Seawolf-class submarines remain shrouded in secrecy, with very few photos or articles released to the press. What reports are available suggests the subs frequently traverse under the polar ice of the Arctic Ocean, at times testing specialized sonars and communications equipment. 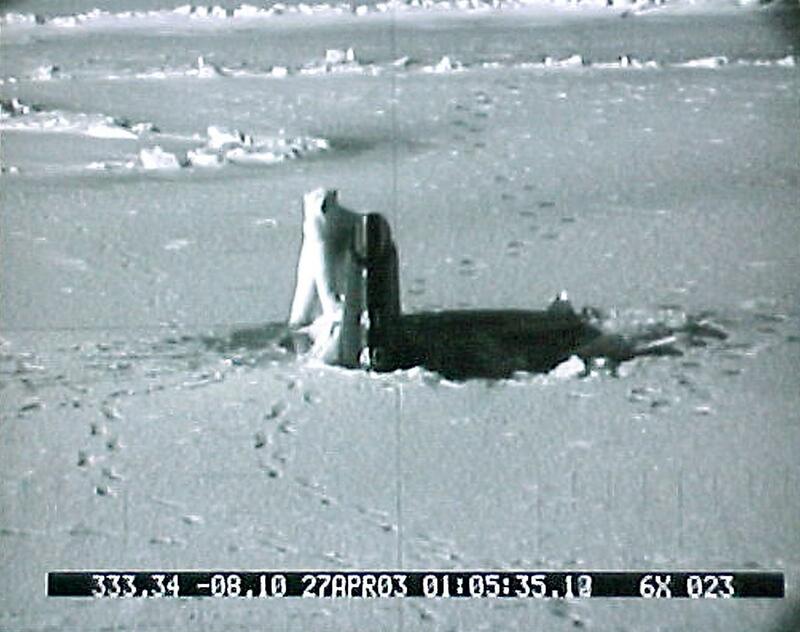 None of the Seawolf subs are known to have engaged in combat, however—unless you count the attack of a polar bear on the Connecticut's rudder after it surfaced through the Arctic in 2003. You can see a picture of the engagement taken via the periscope here. Meanwhile, more affordable ($1.8 billion each) Virginia-class submarines better suited for littoral engagements are entering service, retaining many of Seawolf class’s advanced features such as the stealthy pump jets, while ditching some of the bulk and gold-plating and making greater use of off-the-shelf technologies. Later Virginias also sport vertical launch cells for rapid land-attack capabilities. Demand for the Seawolf’s high-end capabilities may rise, however, due to the return of an undersea arms race involving the United States, Russia and China. China’s submarine fleet will likely soon exceed America in numbers, though the majority of it consists of shorter-range diesel-electric submarines, and even its nuclear submarines are considered to be significantly noisier than their U.S. counterparts. Russia continues to operate stealthy Akula and Borei-class boats and is developing improved successors as well as Poseidon strategic nuclear torpedoes designed to destroy coastal cities. Thus the U.S. Navy reportedly sees the beefier, more heavily armed characteristics of the Seawolf as a model for its next SSN(X) submarine—even if it comes at a similar cost of $5.5 billion per submarine.